I was just casually browsing some of my favorite blogs when a beautiful bread by the Breadchick caught my eye. 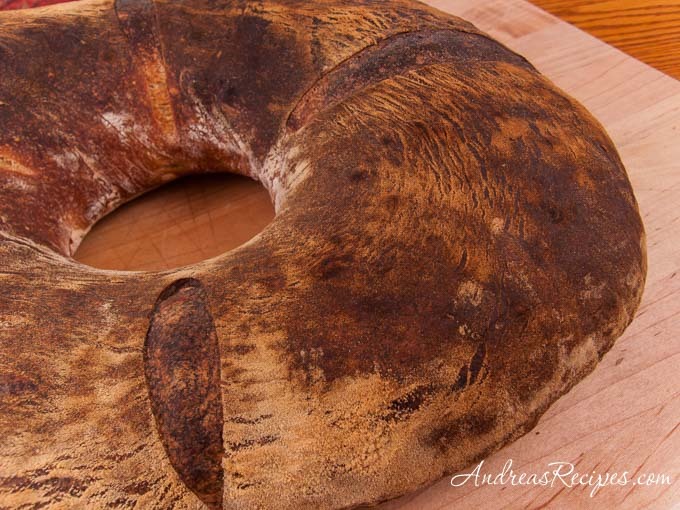 It was gorgeous–a big round loaf with a hole in the middle, an Italian tortano. I had seen another one on Toast a few years ago, back when I still dreamed about making these kinds of breads but thought they were outside my comfort zone. Well I’m happy to report that I’ve been spreading my bread-baking wings over the last few months, particularly since I started making breads from Daniel Leaders Local Breads. That book has been wonderful, and I have a review post coming up this week with photos of all the different breads I’ve been making. So think of this week as A Week in Bread at the Meyers’ House. Since I’ve been trying many new loaves, I couldn’t pass on the tortano from Maggie Glezer as it was too beautiful, but my first attempt ended in utter, abject failure with a dough so wet I couldn’t manage or shape it. I seriously haven’t failed that miserably with a bread in quite a while, and though I was sorely disappointed I wasn’t going to let it get the better of me, so I tried again with a preferment that I started on Friday night and baked last night. It was late when I finished it, so we just left it sitting on the rack and went to bed. This morning I got a better look at my loaf, and I have to say I am pleased, even if it turned out a little too dark. Everything I had read stated this would be a dark loaf and I took that to heart, though I should probably have pulled it out a couple minutes earlier than I did. The flour burned on one end, so for my oven I think I need to keep the rack in the middle rather than moving it up as the recipe suggests. I also learned that my first attempt failed because I didn’t start with enough flour. The second time I weighed my ingredients rather than just scooping the flour into a measuring cup, and the difference in the dough consistency was dramatic. It was still a wet dough, but it was shapeable and actually held the nice big round hole rather than flowing back into the middle. I still wasn’t sure when I put it into the oven, because the instructions say to turn the risen dough over before putting it into the oven. My bread did not look so pretty when I turned it, even though I was very careful, and I was pretty sure that this flat pancake wasn’t going to do anything in the oven. How happy I was to see the dough bounce back with a lot of oven spring! It rose beautifully. We tasted the bread this morning and fell in love. The crumb is chewy and flavorful and the crust wonderfully crisp, though it would have been better if I hadn’t burned the dusted flour on top. Still, we agreed this was the best tasting bread I have made in quite some time, and I will definitely make this again. The boys asked for a piece every time they came through the kitchen, and they devoured it. We only have half the loaf left! Here’s my take on the recipe with instructions for using a stand mixer and a few notes about what worked for me and my oven. I recommend weighing ingredients if you have a kitchen scale, and I use a 6 quart/6 liter food service bucket with a lid for rising the dough (found them cheap at my local warehouse club). As always, ovens vary and environmental conditions will impact your rising times and amount of liquids required, so consider this a guide. Choose either to measure your ingredients by weight or volume, though I had better success with the weight measurements. Breadchick has a full set of instructions in English at her blog. I earned my Bread Baking Buddy badge for completing this challenge! I feel like a Girl Scout again! Karen of Bake My Day is hosting this month, so check out her blog for a full list of all the Bread Baking Babes blogs. Adapted from Artisan Baking, by Maggie Glezer. DAY 1: Make the preferment. Stir the yeast into the water in a glass measure and let it stand for 5 - 10 minutes. Add 1/3 cup of this yeasted water (discard the rest) to the flour and beat this very sticky starter until it is well combined. Cover with plastic wrap and let it ferment until it is full of huge bubbles and sharp tasting, about 12 hours. If your kitchen is very warm and the pre-ferment is fermenting very quickly, place it in the refrigerator after 3 hours of fermenting. In the morning, remove it and allow it to come to room temperature 30 minutes to an hour before beginning the final dough. Preparing the Potato. You can prepare the potato the night before or just before mixing the dough. Quarter it, then boil it in water to cover until it can be easily pierced with a knife tip, about 20 minutes. Drain; if desired, reserve the water for the dough. Peel the skin off and press the potato through a ricer or sieve, or mash it thoroughly with a fork. Store it in a covered container in the refrigerator. You will need only 1/4 cup of potato puree. DAY 2: Mixing the Dough. In the bowl of the stand mixer, stir together the flour and water into a rough, very wet dough. Cover the bowl and let it rest (autolyse) for 10 to 20 minutes. Attach the dough hook. Add the pre-ferment, honey, potato and salt and the mix the dough on low speed (2 on the KitchenAid) for 15 - 20 minutes, or until very silky and wraps around the hook and cleans the bowl before splaterring back around the bowl. This dough is almost pourably wet. Rising: Shape the dough into a ball and roll it in flour. Place it in a container at least 3 times its size and cover tightly with a lid or plastic wrap. Let it ferment until doubled in bulk and filled with large air bubbles, about 4 hours. Using plenty of dusting flour, turn the dough 4 times in 20 minute intervals, that is, after 20, 40, 60, and 80 minutes of fermenting, the leave the dough undisturbed for the remaining time. Do not allow this dough to over ferment or ferment to the point of collapse, because the flavor and structure of your bread will suffer. Shaping and Proofing the Dough: Turn the fermented dough out onto a well floured work surface, shape it into a round and let it rest for 20 minutes. Sprinkle a couche or tea towel or wooden board generously with flour. Slip a baking sheet under the couche/towel if you are using one for support. Sprinkle a couple tablespoons of flour over the center of the ball. Push your fingers into the center to make a hole, the rotate your hand around the hole to widen it, making a large 4 inch opening. I started using both hands to shape the hole just right. The bread should have about 12 inch diameter. Place the dough smooth side down on the floured couche or board and dust the surface with more flour. Drape it with plastic wrap and let it proof until it is light and slowly springs back when lightly pressed, about 1-1/2 hours. Preheating the Oven: Immediately after shaping the bread, arrange a rack on the oven’s second to top shelf and place a baking stone on it. (The dusted flour burned, so I will not move the rack up next time.) Clear away all the racks above the one being used. Preheat the oven to 450° F (230° C). Baking the Bread: Unwrap the bread and flip it onto a floured peel or a sheet of parchment paper. Do not worry about damaging the bread as you handle it; it will recover in the oven as long as it is not overproofed. Slash it with 4 radial cuts in the shape of a cross. Slide the loaf onto the hot baking stone and bake until it is very dark brown, 40 -50 minutes, rotating it halfway into the bake. Let the bread cool on a rack. Preparation Time includes resting and rising times over two days. Andrea, great job! Yours looks fantastic! I baked mine yesterday too! (For the second time also!) Glad you enjoyed it! 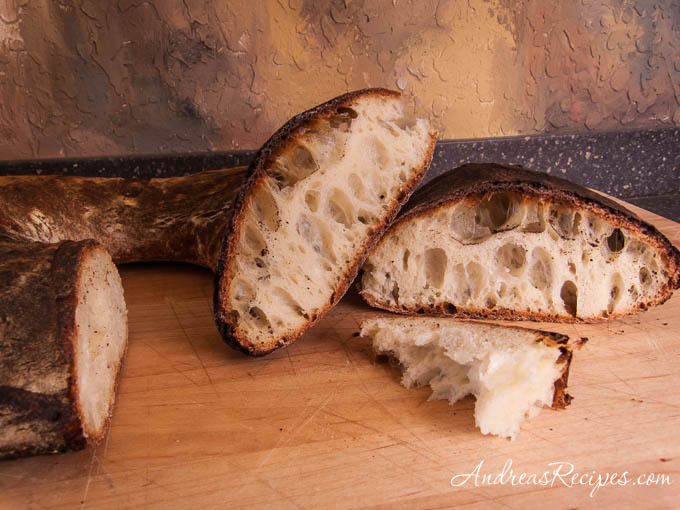 Andrea, what a wonderful looking bread! It is suppose to be that dark believe it or not so it is perfect. Thanks for baking along with the Bread Baking Babes! I just love it! I’m so happy you retried and succeeded. It’s a dough that needs some “understanding” but then you’ll be rewarded with an awesome loaf like you had. Great job and thanks for playing! Great job, Andrea! That’s a tricky loaf to manage and yours turned out beautifully. High five on your beautiful bread! Andrea , What a beautiful Crown you made . Wear it with Royal Dignity ..
Wow this is serious good looking Andrea. Very good! Thanks for baking with us! This is such a wonderful bread, I fear that every bread we bake after this will be a disappointment. Your ‘loaf’ looks great and so nice to have you as our Baking Buddie!! Wow! So delighted to have you baking the crown with us. As Karen says, it does take some understanding! I had to smile reading your post at so many turns. I especially enjoyed your response to the oven spring. This loaf is the definition of oven spring; you can’t miss it with this bread. The thing is once you “get” this bread you do keep baking it over and over. Thanks so much for baking with us. Bread Baking Babes, I had a lot of fun making this bread, and I’m looking forward to more of your bread baking challenges! Great looking holes! I think I’ll have to bake this more than once as well, and I agree that weighing ingredients is the best way. What a lovely bread – the holes in yours are great! Your bread looks wonderful. Congrats! HI,my name is Bernie and i was wondering what is the difference in the mashed potato and the potato puree and how did you make the puree.Also if the dough or mix is pourably wet , how much flour do you add to create a ball.Hope to hear from you since I see the messages are from 2008.